Dorking around on travel sites is my weird little self-soothing, time-wasting extravagance. I don’t know what’s so exciting about plane ticket listings, I just like them. I like them in the way I like cheesecake and Pearl Jam. I once wrote gushing fan-mail to Adioso because I thought their human-centered approach to ticket search was hotter than Jorah Mormont in full plate mail. My first experience with Chinese travel sites was booking tickets on eLong many moons ago – 2007, I think? They had an English language interface and though they didn’t take any international payment methods at the time, I could swing by their office and drop off cash. The top travel companies in China don’t behave like this. They do not toss the plebs an email address and access to a knowledge-base and call it a day. SHANGHAI, Feb. 26, 2015 /PRNewswire/ Epsilon, the global leader in creating connections between people and brands, completed its study on the habits of Chinese consumers. Epsilon’s research report uncovered several other China loyalty trends: Those companies most adept at integrating online and offline touch points to deliver a seamless customer service experience are now commanding the loyalty of Chinese consumers. Apple received the highest score for loyalty of any brand cited, registering 17 percent of brands respondents and cited across all categories. Lifestyle brands directly impacting consumer health, including grocery chains and restaurants, and financial services, also received high loyalty scores. International and domestic flights even have their own landing pages, with deals and callouts separated by destination type. Let me be frank: I’ve pawed through a few piles of research and I can’t get handle on why this is, and I don’t see an answer to that question online. From a UX perspective, it seems redundant. There are slightly different form fields for each search type, but nothing that couldn’t be consolidated into a single interface with a little clever thinking. So, either there’s a copycat issue happening here (everyone does it, therefore I must), a technical issue, or – I suspect – a user behavior issue that perhaps alludes to the possibility that Chinese consumers think about domestic and international travel as two separate things. I am in the process of tracking down some answers, fingers crossed. Assuming that these front-end choices are driven by data, default settings can tell us a little bit about what features are most popular. The default settings for flight ticket search is “domestic, one way”. (“Round-trip” is the default setting for the international tab). 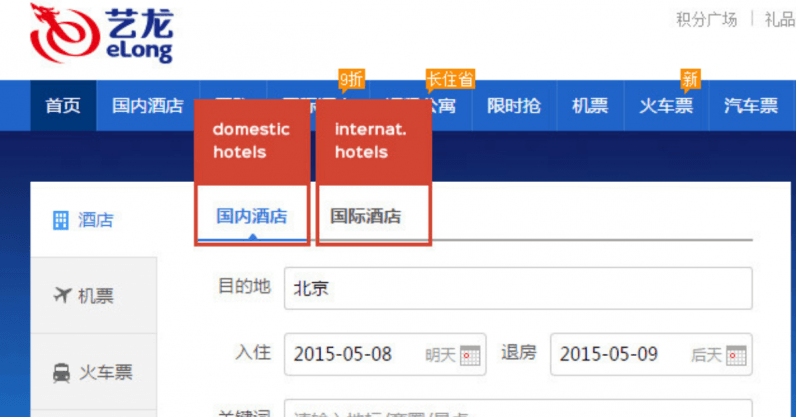 Most Chinese and Western travel aggregators offer similar services in the main navigation. There’s the focus on flights and hotels, there’s secondary booking services for activities, car rental, and some cruises here and there. But the main navigation areas on Chinese travel sites also include gift and charge cards, a focus that is conspicuously downplayed in Western UI. The exception here is again, Alitrip, probably because their payment platforms and account management systems are integrated with Taobao, and Taobao offers its own gifting schemes. And finally, though this is not universal, Qunar and Alitrip both take great care to place product guarantees in relatively important screen real estate positions.